Venerable Sumitta is a scholar in Buddhist Philosophy who is currently pursuing a PhD degree in "Philosophy of Arahanta Ideal". He is an ardent advocate of teaching and applying Buddhist Philosophy and Meditation to improve day-to-day life. 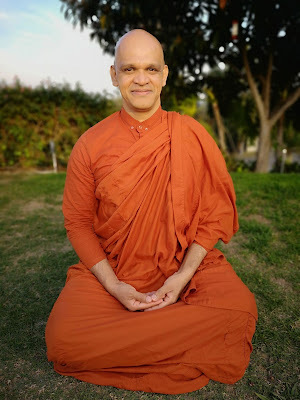 Venerable Sumitta is the founder president of UWest Pali Society at the University of the West where he also serves as an Adjunct Faculty Professor. 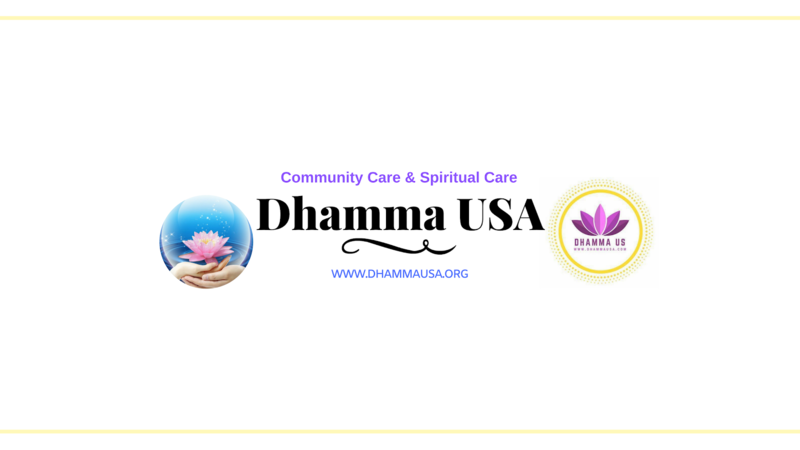 As an outreach program to the society, he formed Dhamma US, a charity organization for community care and spiritual care. In 1981 Venerable Sumitta was ordained as a Buddhist monk under the traditional Theravada Sector in Sri Lanka followed by higher ordination in 1991. 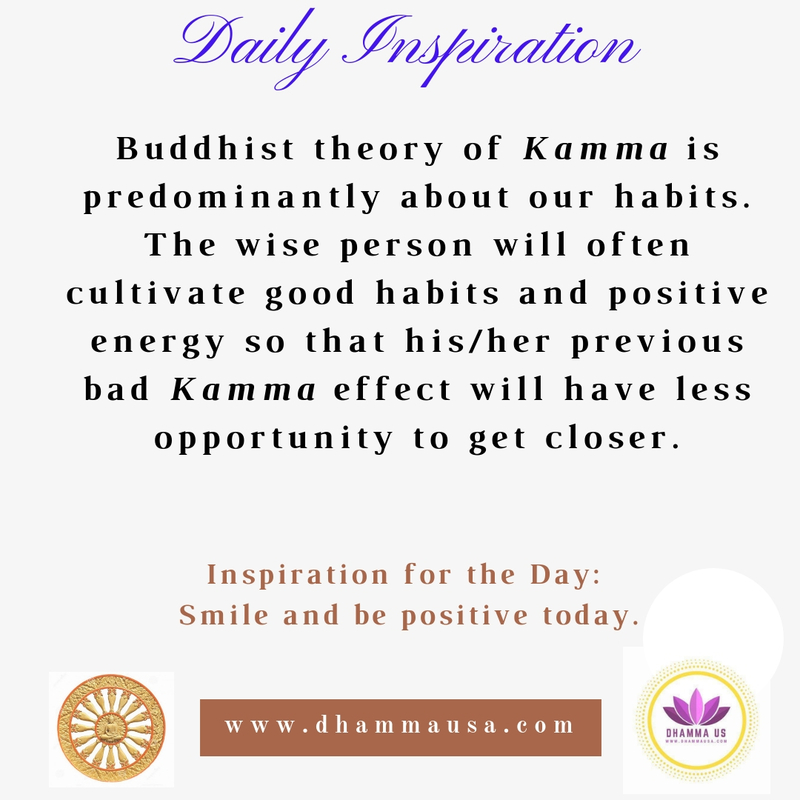 He can be reached at info@dhammausa.com. At a time when Buddhist parents were compelled to send their children to missionary schools since there were no other schools available, Sir Henry Steel Olcott, Madame Blavatsky and Miss Marie Musaeus Higgins arrived in this country, to help the few Buddhist leaders in their quest for moral and philosophical freedom. When Ananda College was established in 1886, it attracted the attention of many Buddhists. In no time students were drawn in from all corners of the island, craving for education catered to suit their own culture. As a result by the end of 1923 Ananda College could no longer cope with the ever-increasing demand. So on November 1, 1925 Mr. Patrick de Silva Kularathne registered Nalanda College as a separate college to fulfill this demand. The name “Nalanda” was picked by Ven. Balangoda Ananda Maitreya Thero. 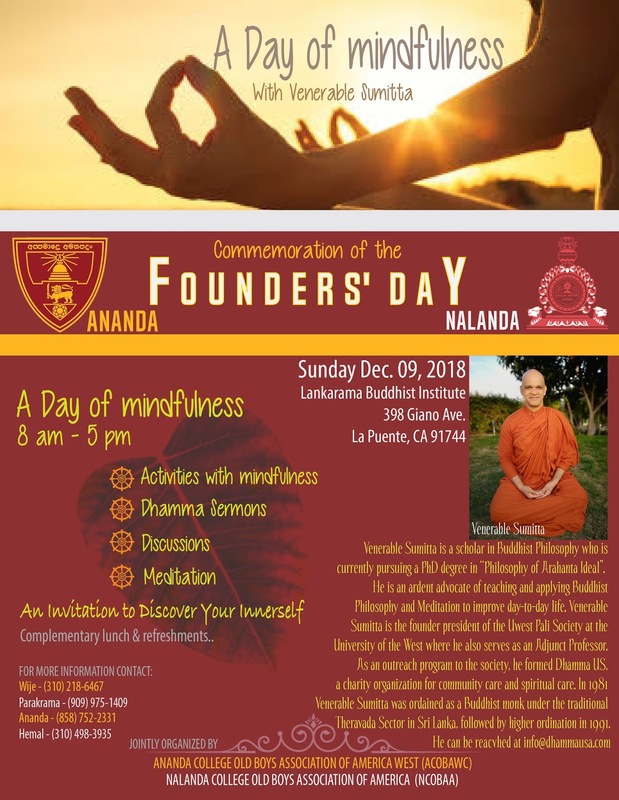 Ananda College & Nalanda College are not products of only those great icons, but an effort by every Sinhalese and every Sri Lankan at that time. Many contributed to build these two institutes by donating a few cents, so our tribute goes to all those great people and others who sacrificed their time, life and money to create these two great institutions. Today Ananda College and Nalanda College have become two of the most popular Buddhist institutions in the country. As proud Anandians & Nalandians it is our responsibility to appreciate founders’ contribution, which we are forever indebted to. Ajahn Brahm. Mindfulness, Bliss, and beyond : A Meditator’s Handbook. Boston: Wisdom Publications, 2006. Dorjee, Dusana. Mind, Brain and the Path to Happiness: A Guide to Buddhist Mind Training and the Neuroscience of Meditation, 2014. Forem, Jack. Transcendental Meditation: Maharishi Mahesh Yogi and the Science of Creative Intelligence. New York: Dutton, 1973. Gunaratana, Henepola. Mindfulness in Plain English, 2011. Hart, William. 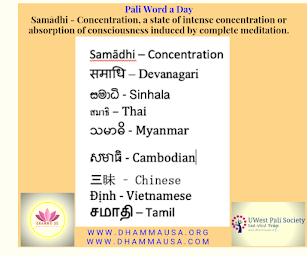 The Art of Living: Vipassana Meditation as Taught by S.N. Goenka. San Francisco: Harper & Row, 1987. Kabat-Zinn, Jon. Coming to Our Senses: Healing Ourselves and the World through Mindfulness. New York: Hyperion, 2005. Nhất Hạnh, Mai. The Miracle of Mindfulness : A Manual on Meditation. Rev. ed. Boston: Beacon Press, 1987. Nyanaponika. The Heart of Buddhist Meditation (Satipaṭṭāna) a Handbook of Mental Training Based on the Buddha’s Way of Mindfulness, with an Anthology of Relevant Texts Translated from the Pali and Sanskrit. [1st American ed.]. New York: Citadel Press, 1969. Nyanasatta, C. The Foundations of Mindfulness: Satipaṭṭhāna Sutta : A Discourses [Sic] of the Buddha. Kandy, Sri Lanka: Buddhist Publication Society, 1974. Ornstein, Robert E. Meditation and Modern Psychology. Los Altos, CA: Malor Books, 2008. Ṭhānissaro. Purity of Heart: Essays on the Buddhist Path. Valley Center, CA: Metta Forest Monastery, 2006. ———. Right Mindfulness: Memory & Ardency on the Buddhist Path. Valley Center, CA: Abbot Metta Forest Monastery, 2012. ———. The Wings to Awakening : An Anthology from the Pali Canon. 5th ed., rev. [Valley Center Calif.]: Metta, 2007.